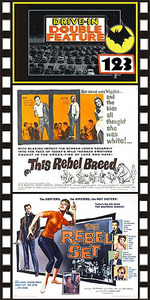 THIS REBEL BREED (1959 aka BLACK REBELS) Rita Moreno, Mark Damon, Gerald Mohr, Dyan Cannon. Damon’s in blackface as blacks take on whites and whites take on Hispanics in this very entertaining teenage gang war extravaganza. Teenage punks slice and dice each other, turn innocent young girls into sleazy tramps, threaten innocent citizens, get involved in interracial romance, and sell drugs to local citizens. Whew! That’s a lotta trashy behavior for one movie. Regardless, the result is a very entertaining JD mini-classic that will hold your interest. Moreno’s next film, West Side Story, landed her an Oscar. Recommended. 35mm. THE REBEL SET (1959) Gregg Palmer, Edward Platt, Don Sullivan. Interesting beatnik film that shows the atmosphere and flavor of the late ‘50s beatnik clubs. It also features an intricately planned robbery scheme. Better than a lot of the other JD stuff that was coming out around the same time. Platt is great as the intellectual ringleader. 16mm.